The Turkish Navy will develop new, intermediate-class frigates, the TF100, that would replace the German-made Mekos. The new frigates will be deployed to the Aegean and Black Sea in the next decade. The roughly 3,500-ton Meko 200-type frigates entered service in the 1990s. Turkey has about 10 of these frigates. The Turkish Navy will need to replace them with the new one, like the proposed TF100s, around 2020. The star of the Turkish Navy will be the four-plus-four TF2000 air defense frigates that are scheduled to be deployed in the 2020s. Turkey will also continue to produce to Milgem-class corvettes. 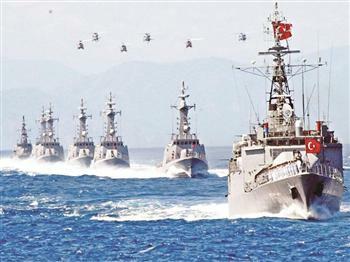 The TCG Heybeliada has already joined the Navy and the TCG Buyukada has been put to sea. SEEMS YOU TRUST THE LETHEALITY OF TURKISH MILITARY TOOLS AGAINST IRAN'S-given your gusto in the elaborations!!!. Would you explain what you mean? Not that Nader displayed any gusto above, but the Iranian frigates where originally designed in the 1950-60s and have not demonstrated any effective anti-air capabilities. Even Iran's new frigates are based off those old designs and So I would trust the Turkish ones over the Iranian ones any day. Having said that, its at least some credit to Iran for developing and maintaining the capability to built and upgrade these vessels under extreme sanctions (not that that counts for anything more than propaganda value, militarily Iran is a long way behind Turkey now). fact one- unless you have your own sources cooked somewhere ,NO BODY IN THE MILITARY WORLD HAS EVER PUT TURKEY AHEAD OF IRAN MILITARILY .and it very easy to imagine so given Turkey's membership to NATO. fact two-IRAN GROWING military independence is forcing TURKEY to initiate an indigenous defense industry-as seen by its severing ties with ISRAEL'S DRONE MAKERS and this time the frigates issue!. -I DONT BUY YOUR IDEA THAT TURKEY IS ANYWHERE NEAR IRAN IN DEFENSE TOOLS!! BM---- " ,NO BODY IN THE MILITARY WORLD HAS EVER PUT TURKEY AHEAD OF IRAN MILITARILY"
as usual, you're full of guano. @-is it true that TURKEY is ahead of GERMANY! !AND FRANCE! !.we are not experts but putting JAPAN,FRANCE,GERMANY below is hard to digest!. @-unless GLOBAL FIREPOWER put open their criteria in compiling their listings,their figures will continue to invite doubts and denials from many people! !.